A few weeks back we decided to brave a journey that exceeded the normal range of the Nissan Leaf. I was looking for an opportunity to try out the public charging points available and this seemed as good a time as any. The plan was to meet some friends at Polesden Lacey in Surrey. This would mean a return journey of 87 miles, which is just nipping at the heels of the maximum range of the car, so a re-charge at some point would certainly make things more comfortable. So we set off with a full charge in the battery. Today this gave me 90 miles, showing that the capacity of the battery can be determined by some outside factors such as temperature, charge time etc. I thought it would be a good idea to drop into Fleet services on the way to top up. 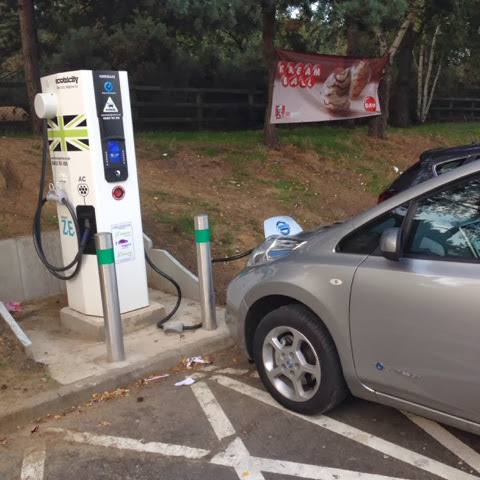 The rapid charge points allow access via an RFID card which needs to obtained via the Ecotricity website. The card is currently free of charge. You simply drive up to the charging point, swipe your card and plug in. Another Leaf owner pulled up beside me and we enjoyed a couple of minutes chatting about our awesome cars, something you wouldn't do at a petrol pump, it's like being in a cool friendly club. Here I learned a downside to the rapid charge points - They only allow the battery to be charged to 80%. This, I understand, is for safety reasons. the charger is throwing down DC current in excess of 100Amps whch can easily lead to a battery getting hot if allowed to charge for longer than 20 minutes. We arrived at Polesden Lacey with 35 Miles left on the range. I did ask the staff if there was anywhere I could plug in but no. Maybe something the National Trust should be considering??? It was about 30 miles back to Fleet services but only about 5 to RHS Wisley. We made the decision to go home via Wisley and grab an hour on the charger while visiting the fine garden centre and café. Unfortunately the charging points in the car park were down. I spoke to the very helpful staff but despite best efforts the Chargemaster points were not playing. 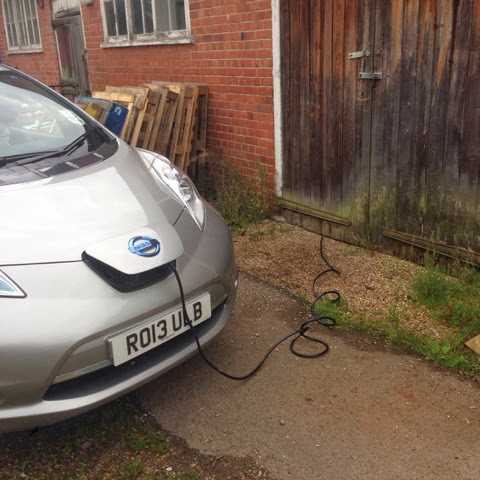 However, as a result we were allowed to plug in through a barn door in the service yard. Lucky for us otherwise we may not have made it home. The only downside was that this was a standard 3-pin 13 amp domestic socket, this being the slowest method of charging the car, so we only gained an extra 10 miles after an hours loitering around the garden centre. On the way to Fleet services I saw, for the first time, a low battery warning in the car, meaning there was only 12 miles left, luckily we were only 5 miles from the next charger and rolled in with a few miles to spare. Now this is where the rapid chargers come into their own, we plugged in and went inside for a cup of tea. I was monitoring the battery in the car via the Nissan App on my phone and after about 15 minutes it told me that the car was now 80% charged with 74 miles on the range. We hadn't even finished our tea. Obviously we then made it home easily. Now, this may all seem like a bit of a faff with the three stops and mild anxiety but to be honest it made the day more fun if anything, a little more adventure. We also would never have visted RHS Wisley which was well worth it (Mrs Colin was particularly pleased with the baby changing facilities). Most of all, not a penny was spent on fuel.